Welcome, everyone, to the first annual FBTB MOC Madness Building Tournament, our most ambitious building contest to date! Seeing as to how 2010 is the 30th anniversary of The Empire Strikes Back, we've decided to use that as the backdrop of this building contest. One of the most iconic scenes from ESB is when the bounty hunters were on the Super Star Destroyer. It introduced Boba Fett to the masses, undoubtedly the most famous bounty hunter of them all, and also gave the audience a peek into their world. One of my favorite scenes from the movie was when the Star Destroyer dumped it's trash just before making the jump to lightspeed. Han released the Falcon's landing claw to float away with the debris and then flew to Bespin. Smart. Only, he didn't realize that Boba Fett in his Slave I was dumped along with the trash and followed him there. Smarter. So, how did Lord Vader find these bounty hunters? Heck, I don't know either but I imagine it involved a battle tournament of some kind, where the winners were each given a boarding pass to the SSD. Your challenge for this tournament is to build your very own original bounty hunter and bounty hunter ship. Please read this entire post before asking any questions. Thank you and good luck! Tournament sign-ups (i.e. submitting your entry) are open from 8:00am July 1, 2010 through 11:59pm Tuesday August 31, 2010 Pacific Standard Time. All entries received will be placed in the group pool round. Voting by the community will occur for one week. The top 32 advance to the next round. In the event we get 100 or more entries, the top 64 will advance to the next round. After the group pool round, the top 32 (or 64) will be paired off into brackets and go head to head. Winners of each bracket will advance to the next round. Bracket play will continue until 1st, 2nd, and 3rd place winners are determined. Voting for each round of brackets will be open for 3 days. A special forum will be created for users to vote for each round. Up to date tournament standings and bracket pairings will be viewable at any time via an image linked to in this post. Final Four round: winners will advance to the finals to battle for 1st and 2nd place; losers will compete for 3rd and 4th place. Prizes will be awarded for 1st, 2nd, and 3rd place. Just like the Olympics, there is no prize for 4th. You must have a flickr account. To enter, reply to this thread and in your post embed three pictures: one of just your bounty hunter; one of just your ship; and one showing the prisoner compartment of your ship. Please use the flickr urls for your images, and include link to your flickr account or flickr set of your entry. You may include a brief description of your bounty hunter including name, name of ship, and origin. Keep it BRIEF, no short stories. Your entry photos must be a single view of your bounty hunter/ship, no multiple views allowed. No special effects, no text/titles is allowed. Generally, no photoshopping or image enhancement is allowed but you may remove the background to isolate your model and balance for color. Posting your photos locks your entry in to the tournament. Replacing your images or modifying your MOC will disqualify you. Once you're in, you're in. 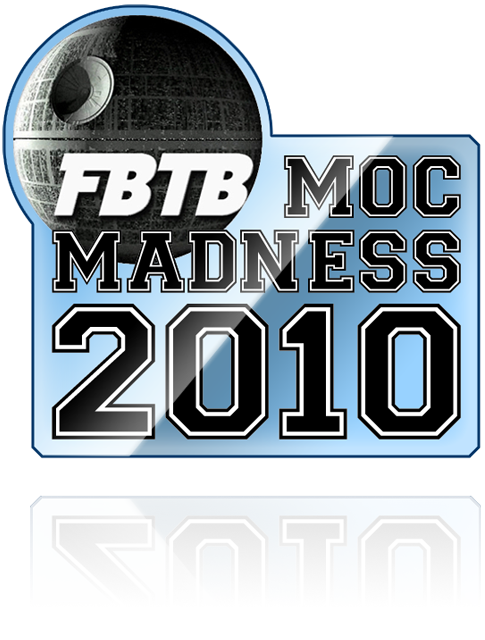 Tag your photos with "MOC Madness 2010" and submit them to the FBTB: flickr Outpost group pool. You may submit as many photos as you wish to the pool. Your MOC must be NEW. No recycled ships from past projects. Your MOC must not exceed 48 studs in length, 48 studs in width, or 48 studs in height. (The large gray baseplates are exactly 48x48 studs.) If there is any doubt about the dimensions of your MOC, you may be asked to submit a photo showing proof. Your MOC must be able to carry the pilot (your bounty hunter) and a passenger (the bounty). Your bounty hunter should follow minifig form: legs assembly, torso assembly, head at the minimum. backpack, cape, helmet, hair, weapons, accessories, etc, are optional. you may use droid elements for your minifig. The bounty is optional. Only use official, unmodified LEGO elements to build your bounty hunter minifig and his/her ship. You may use LEGO stickers. You may not cut the stickers. You may also include a prisoner minifig but it is not required. Real life models only please; computer rendered models will not be accepted. You must be able to receive packages. Winner's choice of White Boba Fett minifigure OR Cloud City edition Boba Fett minifigure. Winner's choice of Chrome C-3PO minifigure, Chrome Darth Vader minifigure, or Chrome Stormtrooper minifigure. 1 copy of 8097 Slave I. White Boba Fett minifigure or Cloud City edition Boba Fett minifigure, whatever first place didn't choose. Choice of remaining chrome minifigure. 1 copy of 8089 Hoth Wampa Cave. Whatever chrome minifigure is left. 1 copy of 7749 Echo Base. FBTB is not responsible for lost, stolen, or damaged packages. By entering this contest, you absolve FBTB of any liability. A tracking number will be provided to the winners whenever possible and does not constitute a contract or agreement of responsibility. I'm only saying this for legal reasons, but honestly, 99.9% of my packages all get to their destinations and you don't have anything to worry about. Sounds awesome. Can't wait to get started. Great, finally a tasty tournament! First is if the bounty hunter has to be an existing one from the expanded SW universe, like all the characters at Wookiepeia or alike, or can it be a made up character? Second is in regard of retractable elements. If they are retracted and exceed the 48x48x48 perimeters, but in a landing position they are within the perimeters, does that count too? Last but not least, are there new themes at every new round where the particpants have to make a new creation or is the bounty hunter and his ship the sole submission for the whole tournament? Heh, music wins. Yes, I'll try and build something, should be fun. Noice, too bad I'm not too good at building ships . Oh well, we'll see what happens. I just hope I won't get paired up some one really good! BTW, I was freaked out by this mysterious noise coming from my computer, then realized you put music in this page . So it begins. This sounds really fun... to the drawing board! Oh and the music = WIN. Well, I've got some ideas up my sleeve. Looks like I'm in. Alex - "Bam, said the lady!" Cool! I'm new to MOCing & frankly am intimidated by ship building. But there's a little known fact about Americans: we cannot resist a bracket. I'll try and put something together for one of you to have a free pass to the second round. Disclosure of location should be required when listing your finds! Does the ship need to be a space ship, or can it be a speeder or hover ship. Hopefully my move'll be complete and bricks unpacked by August, so I'm hoping to have something to enter as well. Master Fetty wrote: Does the ship need to be a space ship, or can it be a speeder or hover ship. as a bounty hunter, what would you rather have? a ship capable of intergalactic travel so you can chase down the galaxy's most wanted? or be stuck on a planet limiting your business opportunities? I wish I could enter I have been viewing the front page for a year but never made an account. [quote=staff]Your MOC must be NEW. No recycled ships from past projects. Just to clarify, I have a ship that I've been "working on" for a couple of years. I did post pics of it on the old forum but it wasn't in any group build or contest. I've been looking for the right motivation to devote the time & resources to polish it off, get all of the pieces in the correct colors and finalize some of the structures and greeblie it up good..
Would this ship be DQed under the rules? Good point. But there's nothing really wrong with it not beign capable of intergalactic travel? Thanks a lot, Draykov and Ace, for effectively rickrolling me. I woke up twice in the middle of the night last night with allergies, and what song do you suppose was stuck in my head? It's very hard to fall back asleep with boxing montages running through my head. Rules wrote: Your challenge for this tournament is to build your very own bounty hunter and bounty hunter ship. OK, I can see how that might be open to interpretation, but it's supposed to be original characters and ships. Cole Blaq wrote: Second is in regard of retractable elements. If they are retracted and exceed the 48x48x48 perimeters, but in a landing position they are within the perimeters, does that count too? That's a pretty big boundary and you're still trying to push it, eh? As much as I like retractable bits on ships - allowing that would be too easy to abuse. So unless Ace wants to override my veto, no. Cole Blaq wrote: Last but not least, are there new themes at every new round where the particpants have to make a new creation or is the bounty hunter and his ship the sole submission for the whole tournament? You're to make a single entry for the whole tournament. This thing would go on forever if you all had to make new ones at every voting stage. We're not that crazy yet. kyphur wrote: Just to clarify, I have a ship that I've been "working on" for a couple of years. I did post pics of it on the old forum but it wasn't in any group build or contest. I've been looking for the right motivation to devote the time & resources to polish it off, get all of the pieces in the correct colors and finalize some of the structures and greeblie it up good.. Sorry, but that's pretty clearly an existing model that you'd just be polishing off for the contest. That wouldn't be fair to the members starting from scratch now would it? Master Fetty, your incompetent bounty hunter idea amuses me. Thanks for the clarification, I just wanted to be sure that "Previous Projects" was all inclusive... There are some features of the existing project that I really like so I'll just do a brand new ship with those features (but an original design). Sounds good, can't wait to see your entry!